This system has two services, one called hello, and one called hello-stream. 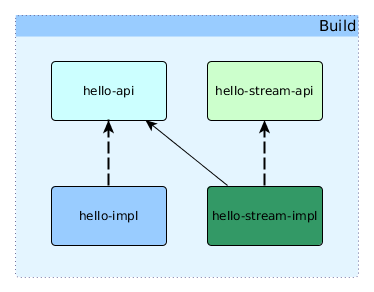 Each service has two sbt projects defined, an API project, hello-api and hello-stream-api, and an implementation project, hello-impl and hello-stream-impl. Additionally, hello-stream-impl depends on hello-api, and uses that to invoke calls on hello. Often libraries will want to support multiple versions of Scala, doing this requires building one artifact for each version of Scala that they support, which introduces the problem of how to differentiate between those artifacts, seeing as maven doesn’t support the idea of adding additional metadata to dependencies to specify what version of Scala they require. To solve this, the convention of appending the Scala version to the artifact is used. addSbtPlugin("com.lightbend.lagom" % "lagom-sbt-plugin" % "X.Y.Z") // replace 'X.Y.Z' with your preferred version (e.g. '1.2.0-RC2'). The project is defined to be the hello-api directory, as indicated by project in file("hello-api"). This means all the source code for this project will be under that directory, laid out according to the usual Maven structure (which sbt adopts as well). So our main Java sources go in hello-api/src/main/java.